Our mission is to help you efficiently manage your price and your basis risk throughout the marketing season. 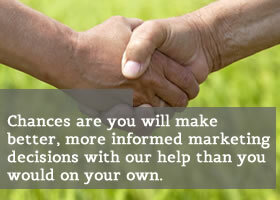 We are in position to help with every marketing related decision you make. It all begins with a customized marketing plan, a plan designed around your level of understanding, your unique financial situation and your profit objectives. We do our best to provide expert advice and timely information presented in a way that can be easily understood. Our role is that of advisor and facilitator. While you will always have the ultimate say in what is done, we are there to offer professional guidance and then to help carry out your instructions when appropriate.